ONE Championship™ (ONE) sent shockwaves throughout the capacity crowd at the state-of-the-art Mall of Asia Arena in Manila, Philippines with another exciting evening of world-class mixed martial arts action last April 21. ONE: KINGS OF DESTINY showcased a series of compelling bouts, punctuated by a thrilling main event that left fans on the edge of their seats. In the main event, Eduard Folayang (Philippines) successfully defended his ONE Lightweight World Championship, defeating Ev Ting (Malaysia) by unanimous decision. 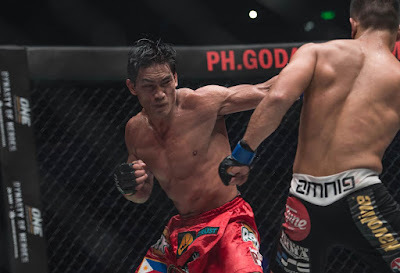 In the main event of ONE: KINGS OF DESTINY, Eduard Folayang retained his ONE Lightweight World Championship with a masterful display of striking to defeat top Malaysian lightweight Ev “E.T.” Ting. Operating behind his world-class wushu stance, Folayang dazzled with his trademark variety of lightning quick and powerful spinning attacks, pouncing on Ting with side kicks and back fists. Controlling the action from the outside with the intent to counter, Folayang allowed Ting to come forward with his attacks which were few and far between. In the end, all three judges agreed on Folayang winning a unanimous decision to remain champion after five thrilling rounds of intense action. After the bout, eight-division world Manny “Pacman” Pacquiao congratulated Folayang inside the ONE Championship cage. In the co-main event of the evening, Team Lakay top bantamweight Kevin “The Silencer” Belingon swarmed Finnish kickboxing sensation Toni “Dynamite” Tauru with a relentless barrage of attacks to earn a scintillating striking victory. Tauru, the taller fighter by over 10cm, used his length to keep Belingon at range but it was only a matter of time before the Filipino would come looking for the stoppage. Tauru tried his best to keep the distance, but Belingon launched a furious offensive to close the gap, pounding Tauru with thunderous lefts and rights. In the end, Tauru had no choice but to bow out of the contest via verbal submission. With another spectacular performance, resurgent lightweight contender and former ONE Featherweight World Champion Honorio “The Rock” Banario marched to victory once more, stopping newcomer Jaroslav Jartim with a monstrous left hook. After spending the first round on the mat with Jartim in technical grappling exchanges, Banario showcased his incredible power in the second round. Catching a kick to the body, Banario uncorked a devastating left hand counter that knocked Jartim out cold, effectively ending the bout in an instant. It was a triumphant return to the ONE Championship cage for 18-year-old Christian Lee. “The Warrior” turned in a tremendous showing against Chinese featherweight “The Werewolf” Wan Jian Ping, dazzling the crowd with his quickness and trademark unorthodox movement. After mixing up his strikes very well, Lee shot in for a successful takedown, bringing Wan to the canvas. Once on the mat, it was all Christian Lee as the youngster went to work, pounding the Chinese fighter with sharp elbows and punches to earn the stoppage victory. With an astounding display of gargantuan strength, Team Lakay top flyweight prospect Danny “The King” Kingad out-muscled Malaysian opponent Muhammad Aiman to win by unanimous decision after three fierce back-and-forth rounds. Kingad, who enjoyed most of the fight with successful takedowns of his Malaysian foe, punished Aiman with elbows and knees from dominant positions. In the third round, Aiman caught Kingad in a triangle but the Filipino powered himself out of it and earned the judges’ nod. In an entertaining flyweight contest, Indonesian standout Stefer Rahardian dominated unorthodox Filipino striker Eugene Toquero with his effective chain wrestling skills, winning by unanimous decision after three rounds of action. For the majority of the bout, Rahardian took Toquero down seemingly at will, and the Filipino spent most of the fight defending off his back. In the third round, Toquero made things interesting by landing a couple of telling blows but it was not enough to offset Rahardian’s superior ground control. 19-year-old Chinese bantamweight prospect “The Stalker” Xie Bin showcased his tremendous grappling skills in defeating Cambodian Khun Khmer specialist Chan Rothana. After a brief feeling out period for both fighters, Xie scored on a takedown to bring the action to the mat. The second round saw Xie score on another takedown, this time working towards a submission. With Rothana completely out of his element, Xie was able to grab a hold of his opponent’s neck, executing a D’Arce choke to seal the win. Team Lakay lady striker Gina “Conviction” Iniong made her successful ONE Championship debut, besting Filipino-English fighter Natalie “The Kilapino” Gonzales Hills with a solid display of striking superiority. Looking to play the role of counterpuncher, Iniong laid back and allowed Hills to press most of the action. Iniong dominated in the clinch with knees to the lower body and scored on a handful of takedowns. She then found a home for her powerful right hand which landed with great accuracy throughout the fight. After three rounds, judges saw the bout in favor of Iniong. 8-time Brazilian jiu-jitsu world champion Michelle Nicolini of Sao Paulo, Brazil extended her winning streak to two wins inside the ONE Championship cage with a beautiful first round armbar over previously unbeaten Irina Mazepa of St. Petersburg, Russia. Nicolini utilized a missed kick from Mazepa to take the Russian fighter to the ground. From there, Nicolini worked her magic, easily taking the bout by submission. Filipino strawweight fighters Robin Catalan and Jeremy Miado kicked off ONE: KINGS OF DESTINY with a wild exchange of striking and wrestling to get the crowd ready for an exciting night of fights. After three gruelling rounds, Catalan emerged victorious by split decision, impressing with a series of emphatic slams while controlling the action on the mat.